Fun with learning! That’s the idea behind Termites on the Ark. The book presents challenging and innovative ways to teach the Bible to children while being sensitive to learning styles and other factors that influence learning. The book is intended to be a supplement or enhancement to other resources being used, to help the Bible stories come alive for children, and to help teachers to regain joy in teaching. 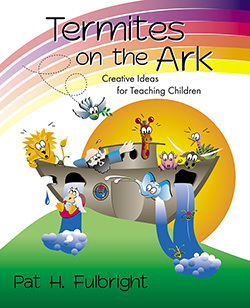 Pat H. Fulbright is an author, independent consultant, and workshop and conference leader in the field of Christian education for children. She is the author of Falling Apart and Other Fallacies: Stories of Survival and Recovery and Troubled Teens — Troubled Parents.